FLOWERSBLOOMS by "Elvie": My "Baju Kurung"
A good friend of mine from Melaka, Malaysia named Suhaila Mohd Zaki gave me a Baju Kurung yesterday to wear on her brother in-law's Wedding Feast at the bride's home. I was so excited to wear this costume and when I tried it on, it perfectly fits me except for the skirt which was too long. However, I managed to resolve the length problem by wearing it above the waist. Nobody will notice it as the blouse is very long. The baju kurung is a traditional Malay costume which loosely translated as "Enclosed Dress". This type of costume is the national dress of Brunei and Malaysia and can also be found in Indonesia, Singapore and Thailand. 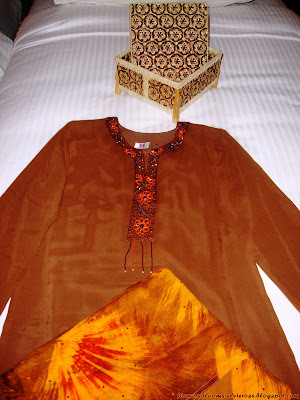 A baju kurung is a loose-fitting full length dress, consisting of a skirt and a blouse. The skirt is made from a long cloth with foldings on one side; the blouse is collarless, has long sleeves, and extends to between the hips and knees. It is usually made of silk, imported from Japan, South Korea, Turkey or India, or from the Malaysian States of Terengganu or Kelantan. The modern baju kurung commonly expresses lively colors and geometric patterns.Traditionalists prefer fabric from peninsular Malaysia's eastern states of Terengganu and Kelantan, where the culture of batik and other hand-designed fabrics is still strong. A woman will often wear a baju kurung with a headscarf (a tudung) in the more conservative states in northern Malaysia. Well, later on I will show you myself wearing my Baju Kurung in a wedding feast.